~ Detail from Taerie's "Angel Light". journal of fellow LotR- and Frodo-fan, visual artist taerie. Her latest Frodo painting is ... sublime. Since Taerie has a locked journal with a limited f-list, it bothered me that almost no one would see her new work. I have asked her and she has given me permission to post it here. Cupid with ridiculously small wings), and I've featured the gorgeous scupture group of Canova's "Cupid and Psyche". based on the myth of Cupid and Psyche (complete with ravishing writing about Frodo-Cupid's wings *swoon*). I am betting there are Frodo fics and pieces of art based on the myth of Icarus, too, another hero with wings. 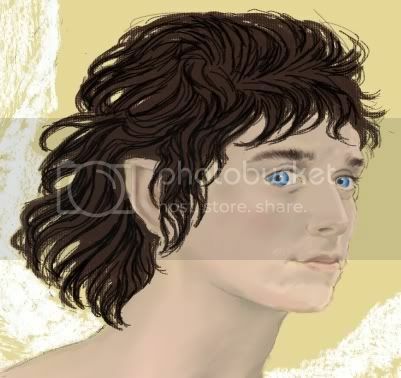 Whatever Taerie's inspiration -- Eros, Icarus, angels, or birds -- I think hers is the best "winged Frodo"
I've seen in fan art. See what you think. Because I think Taerie's work doesn't get enough exposure, I also want to post a recent sketch of hers of great charm. of at least half a dozen highly-rated fanfics, when she looks at this drawing. the colour piece that reminded me of ancient Chinese silk paintings. That is just....beautiful. Just beautiful! "Breathtaking" - yes, Bagma. There are links to more of Taerie's work at Elfwood on her User Info page, I believe. There is a link for her general fantasy work, and one for her LotR stuff. There is not NEARLY enough Frodo in it! We must encourage her: More! More! Beautiful composition and textures (the smooth hair and the fluffed softness of the feathers). Love the position and Frodo's expression (in both!). Perhaps she'd post her pics on Wyna Hiros' hobbitart? Oh, those are both beautiful, thanks for showing them! I hope you let her know about all these comments she's receiving. Thanks, Frankie. Oh, I'll drag her in here to look at her reviews, mark my words! Thank you for posting those wonderful pieces of art. I don't know the artist, but I think I'll go and have a look, her Frodo is just so gorgeous. Unfortunately, Melyanna, I clicked links to her "gallery" of space at the Elfwood Galleries -- my links and the ones in her LJ -- and none of them are working. I am thinking it's a site malfunction. She hasn't posted very many Frodo pieces, but they are all good or excellent. Heavens! **blushes** Thank you Mechtild! You really know how to jump-start that muse of mine! Thanks for all the kind words!! You guys are so sweet. Hey, did you see those comments? Hunh? Hunh? "Why not post this at hobbit_art? ", Notabluemaia suggested. And, below, the estimable Estelanui (a Tolkien afficianado and art fan from Italy) has said, "Why not at Middle-earth News?" See? You should feature these things. Remember, to post at either of these sites, you merely have to follow their formats on their User Info pages (very simple) and post a link. If you don't want to unlock your own LJ posts to link the images there, you can link to my pages where I've hosted your work. My LJ entries, except when they are about family, are always public. Both drawings are so beautiful! Thanks for showing them, Mechtild! Perhaps Taerie would post the links of her works on middleearthnews? Thanks, Estelanui. I just relayed your suggestion to Taerie in the comment above. I actually did ask her to post links to her stuff at M-E News back when she posted "Dangerous When Wet". She just needs a bit of prodding, I think. these are wonderful! I love the expression and the hands on the "wet" one, and I know how hard those are to do! and special thanks for the link to the one from last year :) I missed it the first go around, and its wonderful.. the texture is yummy! All three of them are exceptional, aren't they? - yet all of them are different. The mediums make them look different, but even the particular visions of Frodo are different -- that is, although they all look like the same person -- they all display very different moods or attitudes. I do think Taerie's awfully good. I agree. And I love it that she included Frodo's wounds, if quite subtly. You are welcome, Starlit (P.S. I love the shot in your icon - who could not love that face?). Mechtild, thank you for bringing Taerie’s beautiful works of art here. I hope that many more Frodo fans get to see them. Did you see she broke down and posted it in hobbit_art? It's been getting great feedback. Woo hoo! Stunning. I'm STARING at the drawings for 3 days now and I can't find the right words. I'm sitting here and all I have to say ... they are breathtaking. This is one of the best Wing Art I've ever seen. Thank to both of you. The "wet one" ... god how I love this expression on his face. Thank you Mechtild for this wonderful post! Thank you so much. You are most welcome, Julchen. Taerie has a wonderful eye and vision for portraying Frodo, doesn't she? I really love her Frodo work. I wish she would do more.